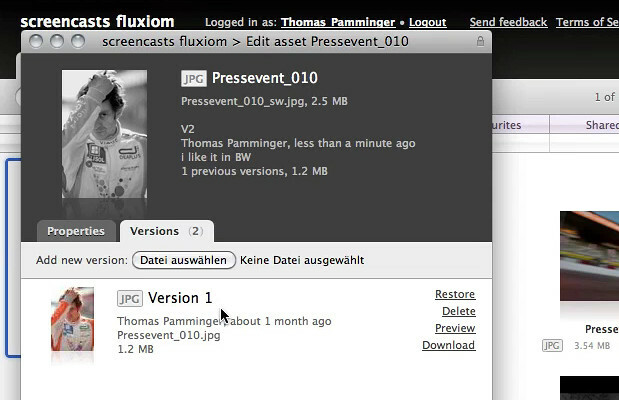 Versioning in Fluxiom allows you to store multiple versions of the same file, making them all appear in your assets view as a single file, all the while retaining the ability to “go back in time” and explore the various alterations that were made to the file over time. Please refer to our pricing table to check whether your account supports versioning. Your assets view will always show the preview corresponding to the last version of the file. A versioned file will exhibit a small “Vx” badge next to the asset to indicate that the asset has version(s). The “x” indicates the number of versions. To view or add new versions to an asset select the asset and click “edit”. In the edit window click on the “versions” tab. If an asset already has versions you can also open the versions window directly by clicking the versions badge. To add a new version of an asset upload a file and optionally add a comment. In the versions window you can preview, download or delete older versions, plus restore any old version. To view all the versions for a particular file, simply select the asset, then click on the “Edit” button at the bottom of the window. If an asset already has versions you can also open the versions window directly by clicking the versions badge. On the right hand side of the window that appears, you will notice a “Versions” tab: click on it to switch to a historical view of the various iterations this file has gone through, from newest to oldest. Each version has its “Preview” link, allowing you to take a closer look at the file. 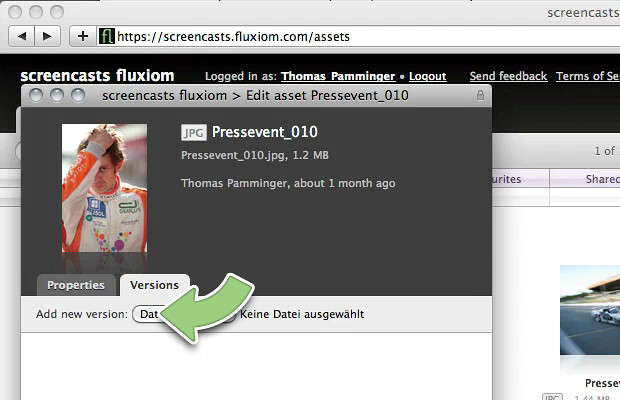 From the versions list, you can download any previous version of a file, or delete a version from Fluxiom, so that it is no longer accessible to users. Whenever you need to forget about recent changes and restore an old version of a file, simply click on the “Restore” link corresponding to the known-good version you wish to bring back. This will not delete the versions created since this old version was uploaded to Fluxiom, but it will bring it back as the “latest version” of the file, in the versions list and in your asset view. The procedure is the same whether you add an new version to a non-versioned asset, or to an asset that has already a long history. Start by selecting the asset you wish to add a version to, and clicking on the “Edit” button to bring up the asset edition window. From there, click on the “Versions” tab located on the right, to switch to the versions view. Above the versions list, you will find a button to add a new version to the asset. Simply select the file on your hard drive and confirm the your selection. Before uploading the file, you can add a comment in the field that appears. This is optional but can help remember changes between the various versions of a file and, more importantly, makes it easier to know who uploaded which version. Any comment entered there will appear in the versions list, below the version in question.